Many OTR fans would agree that Dragnet was pretty close to being the perfect radio drama. It would be hard to pick out a single element which made Jack Webb’s creation such a wonderful program, but high on the list would be the high degree of realism that Webb brought to the show. For radio, Dragnet was incredibly "visual". Most radio programs would use two sound-effects experts. 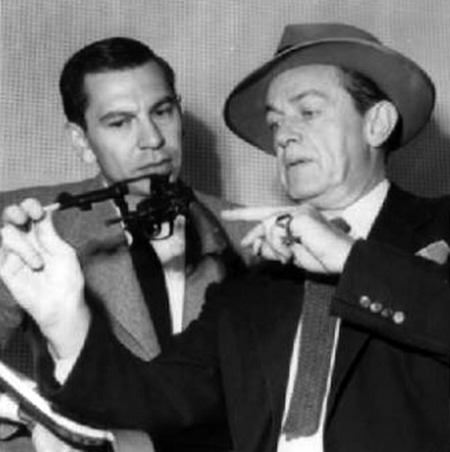 Dragnet needed five, an average half-hour script could have as many as 300 sound cues. Sgt. Friday would provide narration just like a hard-boiled detective, but, for the most part, the story was told through the dialog without the dialog telling the story. The audience was simply listening in on a real life conversation, sometimes just everyday small talk, other times matters of great import. Most of all, Dragnet let us see the policemen who protect our cities as real people doing an important and sometimes dangerous job. Sometimes the crimes they investigated we literally life and death matters, sociopathic killers and terrorists at the top of the list. But the cops still did their job with the same intensity when they were investigating more mundane criminals like shoplifters or bad-check writers. It was this intensity and pride in their work that taught us to respect and admire not only the cops on the radio but the policemen in our hometown. The show was presented from Friday’s perspective, but it was the cops around him that brought the show to life. One of the most important was Friday’s partner, Sgt. Ben Romero. Although he had the same dedication to the job as Friday, Romero had a life beyond the police. He was married with children and not above complaining if his feet hurt from walking all day. Romero’s humanity made Friday’s seriousness and intensity more believable. When Webb was putting together the cast for Dragnet, he naturally turned to actors who he had a good previous working relationship. Raymond Burr had been a regular on Pat Novak for Hire and Webb hired him to play Chief of Detectives, Captain Backstrand. Friday’s partner would be played by Jack Webb’s good friend Barton Yarborough. Just like Ben Romero, Yarborough was a transplanted Texan. He had run away from home as a youth with the dream of going into vaudeville. He began working in radio during the 1920s to fund his studies at the University of Nevada-Reno and USC. He did repertoire theater work in New York before being hired by NBC in 1930, broadcasting from Jack Webb’s stomping grounds, San Francisco. Barton eventually settled in Los Angeles and became a steady player among the community of "Radio Row" actors. In 1932, Carlton E. Morse hired Yarborough to play Clifford Barbour, the second son in One Man’s Family. By 1939, the serial nature of One Man’s Family was still going strong, but Morse was ready to go in another direction, which he did with I Love a Mystery. He brought Yarborough to the new program as Doc Long. Doc Long, a "tall, red-headed, woman-chasin’ Texan" was a perfect fit for Yarborough’s Texas bluster. The Triple A-1 Detective Agency sent its members around the world on adventures that often appeared to have a supernatural bent. The series was one of the influences for the Scooby Doo cartoon franchise, but instead of being a coward who had to be bribed with food (not that Doc Long was the sort to turn down a healthy plate of vittles), Doc Long was just as happy to solve things with his fists. Dragnet premiered on June 3, 1949, and got off to a rocky start as the show found its rhythm. 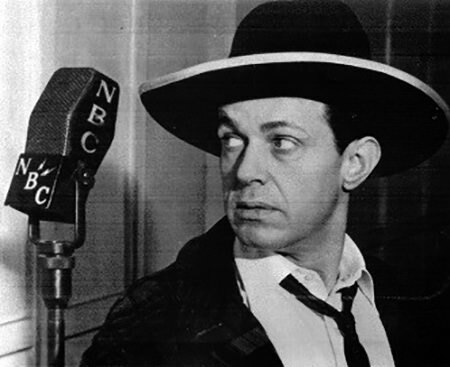 After the first few, less than auspicious episodes, Webb developed his deadpan but fast-talking persona and NBC realized they had a hit on their hands. 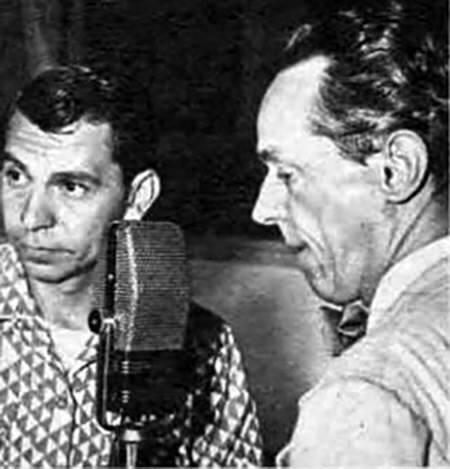 The show seemed perfect to be adapted to television and preparations began to include it in the 1951-52 lineup (Jack Webb was still dedicated to radio and kept the radio version on the air until 1957). There was always some concern when bringing a show from the radio to the screen, "Will they look right?" When confronted as to whether the somewhat chubby Yarborough would stay on as Friday’s partner, Webb was definite: "I’ll take the actor and he’ll look right." Webb’s Mark VII Productions went to work shooting a pilot and a second episode, but immediately after "The Big Actor" was in the can, Yarborough suffered a fatal heart attack. Barton Yarborough died on December 19, 1951. The Dragnet Christmas episode from 1949, ".22 Rifle for Christmas" broadcast the next night. The December 27 episode was rewritten to fit the situation. When Friday arrives at the station, he not only learns that a pair of armed escaped convicts have landed in Los Angeles, he receives the news that his trusted partner, Ben Romero, has suffered a heart attack. The episode was titled "The Big Sorrow". One Man’s Family would go on to be one of the longest running of radio soap operas, running uninterrupted from 1932 until 1959. Through the years, and especially during the War, actors and characters would come and go. After Yarborough died, however, Clifford was simply written off the show. He was also in I love a Mystery and he had his own cowboy show-the name escapes me right now. He died at age 53, I saw wow, that was young. But then I think of my mother going strong at 75 and my grandmother at the same age as being housebound. Vast difference.